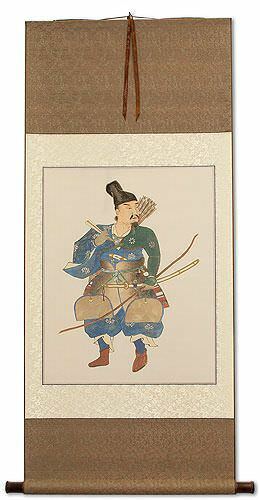 Artwork Panel: 25.5cm x 41cm ≈ 10" x 16"
Silk/Brocade: 34.5cm x 104cm ≈ 13½" x 41"
Width at Wooden Knobs: 43.5cm ≈ 17"
This depicts an archer, holding his bow. 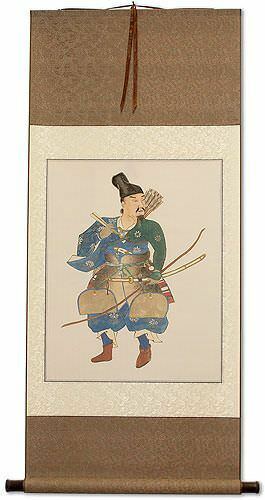 The bow had not been strung for battle, and he is holding a closed fan, so perhaps he is in transit or taking a break. However, the expression on his face looks rather vigilant, so his guard is not completely down. While his uniform and armor arrangement suggest that his primary function is as an archer, he also carries a sword. 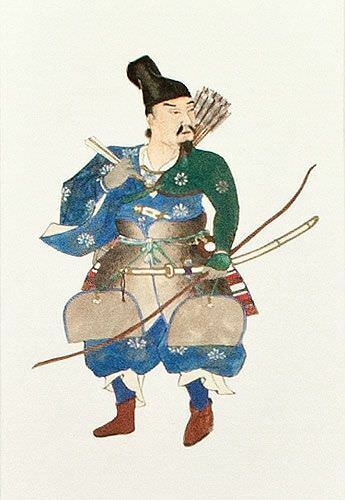 If forces are being overrun, every archer becomes a swordsman at the bitter end. If that were not enough, look closely, and you will find a tanto-dagger is tucked in his waistband. The original artist is not known. 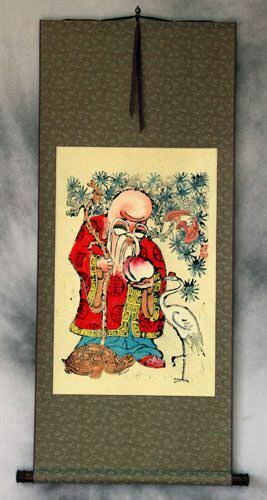 The date the original woodblock and print was made is believed to be in the early to mid-1800s. The U.S. Library of Congress seems to be the only organization that possesses and original print (it's been in their collection since 1906).